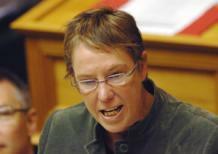 Wellington, July 18 NZPA - A lack of interest in the Health Ministry's top job shows concerns about the Government's direction for the sector, Labour and the Greens say. However the Government says it is just a matter of getting the right person for the job. The Dominion-Post yesterday reported that Stephen McKernan had not been replaced nearly five months after his resignation in a job that pays between $550,000 and $560,000. His was one of six top positions unfilled in the public sector. Labour health spokeswoman Ruth Dyson said the lack of interest showed leading candidates did not have confidence in Heath Minister Tony Ryall while Green MP Kevin Hague said it showed the folly of not trying to retain Mr McKernan. "Most people with suitable experience in the health sector will also be aware that the minister's direction for the health sector is designed to make him look good, rather than best advance New Zealanders' health," Mr Hague said. "The minister is overturning a decades-old consensus on the importance of public health and community-based services, so those prepared to take on the director general role are most likely to be people interested in personal career advancement than health." Unions raised concerns that the job was unattractive because of tight budget constraints. The State Services Commission told the Dominion-Post it would take as long as was needed to find "the best possible person". Mr Ryall said changes were needed in the sector and the right person was needed. "There's support across the country for the improvements we are making to the health service," he said. "Recruitment and employment matters are the responsibility of the State Services Commissioner. Like most countries our health service faces huge challenges and we want the SSC to get the best person." Applications were originally meant to close on April 6 and current deputy Andrew Bridgman would take on the acting director-general role when the position becomes vacant on July 31.